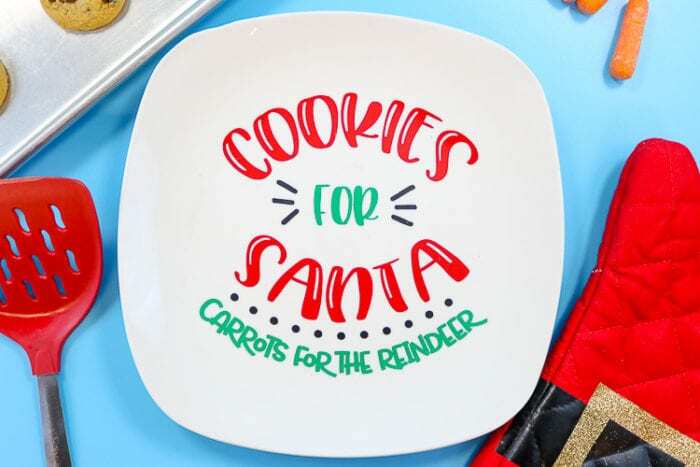 Cookies for Santa, Carrots for the Reindeer! 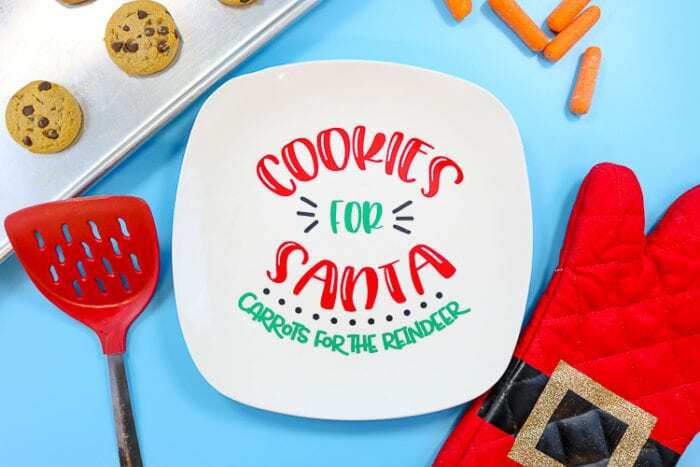 We still have Christmas magic in our home and I honestly was looking for something new from this Personalized Charger that I made a few years back so I designed a new Cookies For Santa Plate SVG! 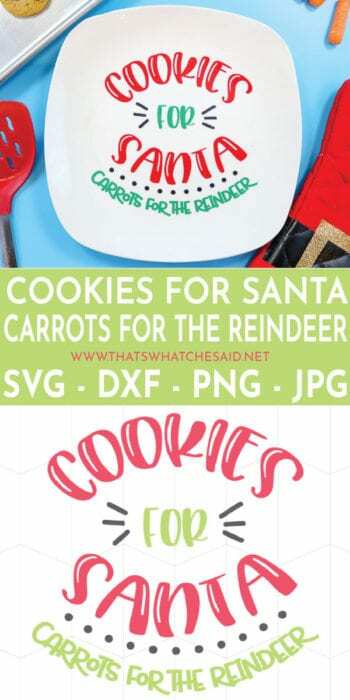 This version I included the reindeer! 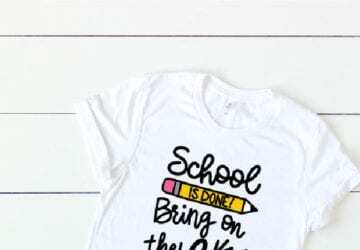 If you are new to using craft vinyl, I invite you to check out my Vinyl Basics post as well as my Best Tips on How to Correctly Apply Craft Vinyl post. I have included both a round and a straight design. Even though my plate is square, the center portion is actually circular! So I did both designs so that you would have a design that works for both round or square plates! I cut my vinyl using my Cricut Maker. I weeded all the excess vinyl with my weeding hook, leaving only my design. I used transfer tape to easily move the vinyl from the paper backing to my plate. 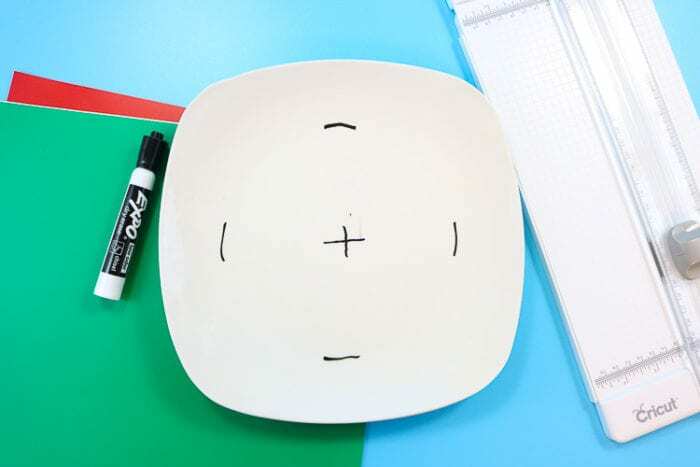 A tip I use to help center my designs: I use a dry erase marker to mark the center and where the edges of the plate start to curve up. It’s hard to see when trying to place the design and this helps. Be sure to erase the marker BEFORE you place the vinyl though! I like to stick mine down on one edge, erase the marker and then place. Is Craft Vinyl Food Safe? 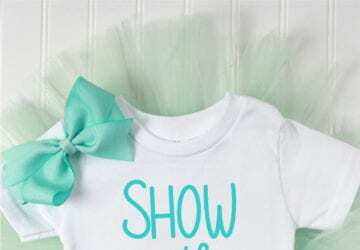 If you are nervous about it, simply use a clear plate, mirror the design before cutting and place on the back of the plate. Similar to my Vikings Plate that I painted. 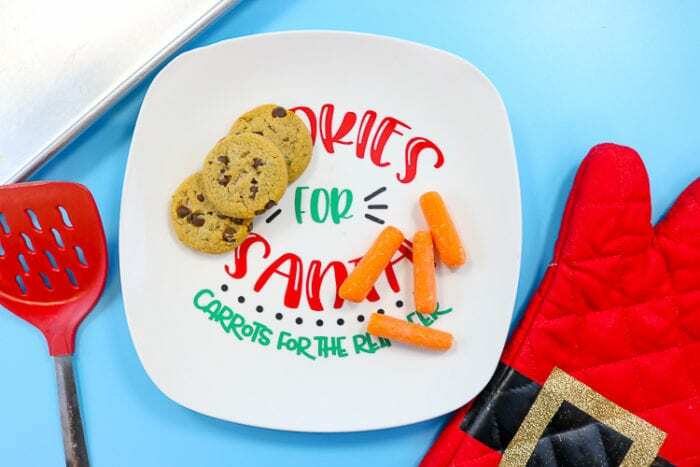 Can This Santa Plate Go in the Dishwasher? I will tell you that EVERYTHING goes in the dishwasher at my house. Momma needs all the help she can get around here. If you want my “official” response it would be that it depends on what type of vinyl you use and how powerful your dishwasher is. This is a FLASH FREEBIE which means it will only be free until 12/14/2018 and then it will move to my shop. THE FLASH FREEBIE HAS ENDED. I’m feeling kinda dumb….just got back from a week long cruise and can’t figure out how to download this file. I click on download, but nothing happens. Nevermind…..I figured it out. Vacation messes with my mind…..a week off of thinking and crafting and I’m back to square one….lol. Thanks for the great file!